Primary ciliary dyskinesia (PCD) is a genetically and clinically heterogeneous disease characterised by abnormal motile ciliary function. There is no “gold standard” diagnostic test for PCD. The European Respiratory Society (ERS) Task Force Guidelines for diagnosing PCD recommend that patients should be referred for diagnostic testing if they have several of the following features: persistent wet cough; situs anomalies; congenital cardiac defects; persistent rhinitis; chronic middle ear disease with or without hearing loss; or a history, in term infants, of neonatal upper and lower respiratory symptoms or neonatal intensive care admission. The ERS Task Force recommends that patients should be investigated in a specialist PCD centre with access to a range of complementary tests: nasal nitric oxide, high-speed video microscopy analysis and transmission electron microscopy. Additional tests including immunofluorescence labelling of ciliary proteins and genetic testing may also help determine the diagnosis. to enable primary and secondary care physicians to: identify patients who need diagnostic testing; understand the diagnostic tests that their patients will undergo, the results of the tests and their limitations; and ensure that appropriate care is subsequently delivered. Primary ciliary dyskinesia (PCD) is a genetically and clinically heterogeneous disease characterised by abnormal motile ciliary function. It is inherited predominantly in an autosomal recessive pattern. Mutations in genes that encode ciliary proteins or assemble those proteins lead to abnormal function and ultrastructure of epithelial cilia in the lungs, paranasal sinuses, reproductive system and Eustachian tubes. Mucociliary clearance provides an important defence mechanism in the airways against bacteria and particulate debris. Patients with PCD therefore develop recurrent and chronic infections of upper and lower airways, and conductive hearing impairment . Airway symptoms often start within a few hours of birth . Many, but not all, males are infertile due to immotile sperm. Subfertility is probably an issue for some women, caused by immotile cilia in the Fallopian tubes, but data are lacking. Dysfunction of motile cilia in the embryonic node causes situs abnormalities in half of patients, e.g. situs inversus or situs ambiguous, which can be associated with congenital heart disease . Very rarely, PCD is associated with hydrocephalus because of defective ependymal motile cilia, which propel cerebrospinal fluid through the cerebral ventricles; and with retinitis pigmentosa, inner ear deafness or renal disease because of defective nonmotile primary cilia, which act as photoreceptors in the eyes, stereocilia in the inner ear and mechanoreceptors in renal tubules . Mutations in >35 genes are known to cause PCD but more are yet to be discovered . The large number of PCD genes and even greater number of disease-causing mutations results in a disease that is highly heterogeneous in ciliary morphology and function. For example, DNAH5 is a gene that encodes a protein in the outer dynein arm (figure 1), a structure that drives the power needed for cilia to move . Patients with biallelic mutations in DNAH5 have cilia that are mostly static and transmission electron microscopy (TEM) will reveal missing outer dynein arm structures (figure 2a). CCDC39 and CCDC40 encode proteins that are essential for the assembly of dynein regulatory and inner dynein arm complexes. 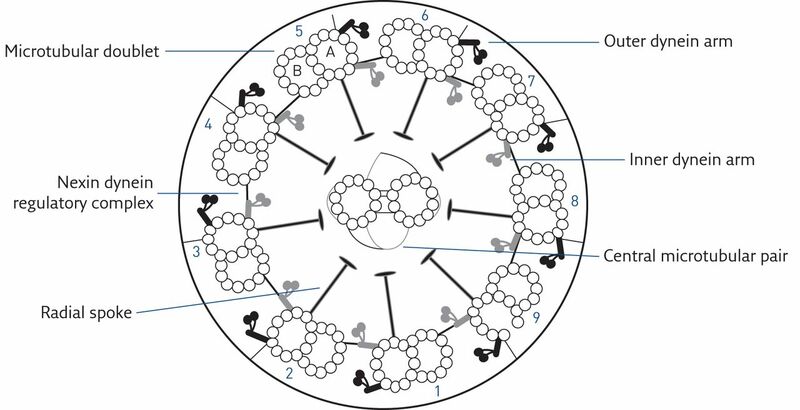 Patients with mutations in these genes have cilia that can move but have an extremely stiff ciliary beat with poor amplitude; analysis by TEM shows microtubular disorganisation and missing inner dynein arms (figure 2b) . PCD is estimated to affect one in 10 000 people, although the true prevalence is unknown and many patients remain undiagnosed. In populations with a high proportion of consanguineous marriages, such as British Asians, prevalence can be much higher: up to one in 2000 people, which is comparable to cystic fibrosis (CF) . A European survey conducted in 2007–2009 found that in most countries, only a small fraction of PCD patients had been diagnosed, particularly among adults, with a wide variability between countries . The reasons for under diagnosis are multifactorial. General practitioners, paediatricians and even pulmonary physicians rarely see a case, and their awareness of the condition is thereby limited. An international survey of PCD patients reported that 37% of patients had >40 visits to medical professionals due to PCD-related symptoms before being referred for testing . PCD symptoms are nonspecific and it is not surprising that patients with situs inversus, a rare condition in the general population, are diagnosed at an earlier age . The need for highly specialised diagnostic tests, often available only at a long distance from the patients’ homes, contributes to underdiagnosis, as the availability of tests varies across Europe . The situation is worse for adults and a disproportionately large percentage of patients in the International PCD Cohort are aged <20 years , whilst it is expected that most patients will live to later adulthood. Assuming a prevalence of one in 10 000 and a near normal lifespan, we expect ∼800 PCD patients in Switzerland (population 8 million) and 6500 in the UK (population 65 million). Currently, we know of ∼120 diagnosed patients in Switzerland, of whom most are younger than 20 years, and about 600 in the UK, including ∼330 children aged <18 years. These figures illustrate the large proportion of undiagnosed patients, particularly among the adult population. If all patients with PCD were diagnosed, respiratory centres should have one PCD patient for every four to five CF patients cared for. With the aforementioned concerns in mind, in 2014, the European Respiratory Society (ERS) commissioned a Task Force to provide guidelines for the diagnosis of PCD. The group included adult and paediatric physicians from pulmonology and ear, nose and throat (ENT) disciplines along with diagnostic scientists. The Task Force developed the first evidence-based guidelines for the diagnosis of PCD, full details of which were recently reported . The aim of this article is to provide a short and comprehensible summary of the guideline for use by primary and secondary care physicians. What evidence did the Task Force use for the guidelines? Throughout the process, they used the rigorous Grading of Recommendations Assessment, Development and Evaluation approach for formulating questions for the systematic reviews, from grading the evidence to deciding the strength of recommendations [13, 14]. To determine the value of diagnostic tests, the Task Force required studies that mimic the clinical situation. Thus, they should include patients referred for PCD testing in whom the diagnosis is initially uncertain. Therefore, case–control studies that compare previously diagnosed typical PCD patients with healthy controls or patients with other diagnosed diseases such as CF are of little use since this situation does not occur in clinical practice. Only a minority of published studies had a suitable study design for the Task Force. For instance, the systematic search identified 98 manuscripts about nNO but only four met the inclusion criteria for study design; none of the studies on genetics or immunofluorescence met the criteria . Which patients should be referred for PCD diagnostics? How many PCD patients are expected in a typical practice? A typical primary care physician (general practitioner (GP) or general paediatrician) in Europe cares for ∼2000 persons. This means that they are expected to have 0.2 patients with PCD at any time. This corresponds to one patient per five primary care physicians or one patient in the lifetime of a GP who works several decades. A specialist, such as a pulmonologist or ENT physician, might cover a region with 20 000 inhabitants and, on average, would be expected to have two PCD patients in their practice and to make a new diagnosis every 40–50 years. Thus, not just primary care physicians but even pulmonary or ENT specialists have limited expertise with PCD. 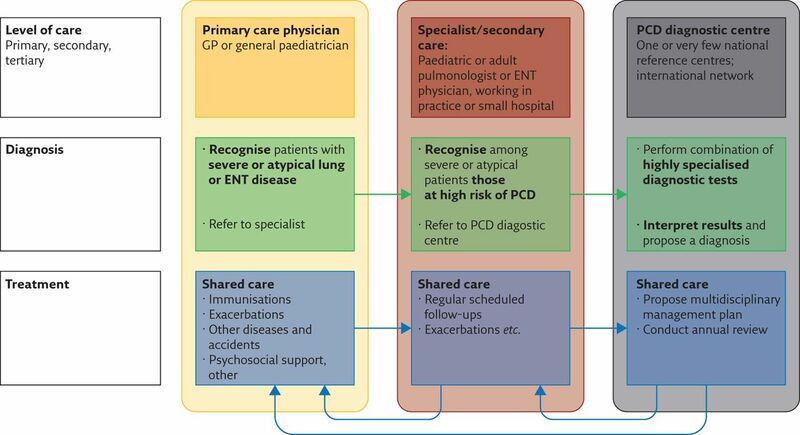 In order to improve diagnosis of PCD (and other rare diseases), primary care physicians, specialists and PCD centres need to coordinate their roles (figure 3). GPs and general paediatricians should triage. Amongst the many patients with respiratory symptoms, they need to identify the patients who need to be referred to a specialist (pulmonologist or ENT physician) because of severe or atypical disease. Diagnostic centres must have the technical facilities and expertise to make a state-of-the-art diagnoses and determine if the patient has “definite PCD”, if PCD is “highly likely” or “highly unlikely”, or whether test results remain inconclusive (see the section “Has the patient got PCD?”). How can we identify patients who need PCD testing? Is there a good screening test for PCD? The Task Force concluded that we lack a satisfactory test for widespread screening for PCD [5, 15]. The best available approach is a combination of typical symptoms and nNO. Can we use nNO to screen for PCD? nNO on its own cannot be used to screen for PCD in primary or secondary care . Although nNO is low in most patients with PCD, discrimination is not perfect. Some patients with PCD have normal nNO, while people with CF or even healthy people can have low values. Although the sensitivity and specificity are very good, the positive predictive value (PPV) of a low nNO reading depends on the prevalence of PCD in the studied population. In a PCD diagnostic centre where patients have been referred based on typical clinical symptoms, ∼10% of patients will have PCD. In this setting, the PPV is 44%, meaning that 44% of patients with a low nNO have PCD . However, in a primary care setting where one in 10 000 patients has PCD, the PPV is 0.06%. This means that nNO is of no use in the general population because only about one in every 2000 patients with a low nNO has PCD. If all patients with a low nNO measured in primary or secondary care were referred to a PCD reference centre, these centres would be hopelessly overloaded. Therefore, only patients with typical symptoms should be screened with nNO [15, 16]. In addition, it is technically not so easy to obtain valid test results for nNO, particularly for infants and children, and the physician needs experience with the method to get reliable results. Can we determine whether patients are at high risk of PCD based on their clinical presentation? The diagnostic value of combined symptoms was also highlighted in an independent study from the USA, which was not included in the guideline because it used a different study design . It described 534 patients with high suspicion of PCD and used expert-predetermined questions to define and refine clinical features . The study found that the combination of unexplained neonatal respiratory distress, early-onset year-round wet cough, early-onset year-round nasal congestion and laterality defects was most useful to distinguish PCD patients from others. However, both the UK and US studies were conducted at tertiary care PCD diagnostic centres, and thus do not reflect the spectrum and severity of patients seen by a normal pulmonologist in a practice or smaller hospital. The PPVs of theses scores, when used in primary or tertiary care, are in the same range as those for nNO alone . How can we improve referrals of patients? Currently, the ERS Task Force guidance is that primary care physicians should refer patients with severe or atypical symptoms for further evaluation to specialists (paediatric or adult pulmonary and ENT physicians). These specialists should base their decision for referral of patients to a PCD diagnostic centre on a set of typical symptoms (table 1), possibly in combination with nNO. Common sense suggests we should modify the symptoms based on the age of patients but solid evidence from age-stratified studies is still lacking . Which tests are used in a PCD reference centre for diagnosis? There is no single “gold standard” diagnostic test for PCD and diagnosis requires a number of technically demanding, sophisticated investigations [19, 20]. Therefore, the Task Force recommends conducting testing only in specialised centres with a high throughput of referrals ; they consider this necessary to provide experience of the range of normality and abnormality associated with PCD in comparison to respiratory patients without PCD (figure 3). The Task Force investigated the evidence for the five PCD tests in common use: nNO, HSVA of ciliary beat frequency and pattern, TEM, genotyping and IF staining of ciliary proteins (table 2). The availability and combination of these tests varies between countries, and the guidelines therefore provide some flexibility in which tests should be used; ideally, specialist centres will provide access to all tests that contribute to the diagnostic decision (figure 4). nNO was traditionally advocated only as a screening test for PCD . The Task Force recommended that in addition to screening, nNO should be part of the battery of confirmatory diagnostic tests given its excellent sensitivity (90–100%) and good specificity (75–97%) . Moreover, it is relatively easy to perform, noninvasive and affordable. Measurements in school-age children and adults should ideally use a chemiluminescence analyser with a velum closure technique . There is some evidence that younger children who cannot make the breath-hold manoeuvre can have nNO measured during tidal breathing but the discrimination between PCD and non-PCD may be poorer, particularly in infants, in whom nNO is low even in healthy children . In a study of 117 consecutive referrals for all ages, Marthin and Nielsen , reported high false-positive rates (36%) for pre-school children. Cheaper portable analysers might be used to screen for PCD in referring hospitals but measurements should be repeated in a specialist centre using the reference standard, a chemiluminescence analyser. HSVA is an important part of the diagnostic portfolio but in isolation is not sufficient to rule PCD in or out; if both nNO and HSVA are normal, further investigation is not required in the majority of cases . Patients with PCD have an abnormal ciliary function, and ex vivo assessment of ciliary beat frequency and ciliary beat pattern in respiratory epithelium from the nose or bronchus is informative. For patients, nasal sampling is a quick but uncomfortable procedure. Many patients with PCD have clearly visible abnormalities of ciliary function (e.g. static cilia or rotating cilia) but some have more subtle defects such as an incomplete sweep. Analyses should therefore only be conducted by experienced observers, and always combining ciliary beat pattern and frequency. Although the results of HSVA are available on the day of testing, further analyses are often needed because secondary defects (caused by sampling, bacteria or viruses) cannot be distinguished from subtle abnormalities of function seen in some variants of PCD. Reanalysis by HSVA following culture of the cells can improve the diagnostic accuracy by mitigating secondary defects [25, 26]. Again, this needs specialised laboratories with experience in culture of ciliated cells. For patients with abnormal nNO or HSVA, further tests are needed to confirm the diagnosis. TEM is an expensive and time-consuming investigation, again requiring the expertise of a specialist centre to identify abnormalities of ciliary ultrastructure (e.g. absent dynein arms and microtubular disarrangement) (figure 2). The ERS Task Force recommended that since TEM is highly specific (>99%) and can confirm a diagnosis, it provides a key part of the diagnostic process . However, TEM is normal in 15–20% of patients with PCD and it therefore cannot be used in isolation to exclude a diagnosis . The role of genetic testing as a diagnostic tool for PCD could not be evaluated by the Task Force in an evidence-based way, as there were no studies designed to assess this question. Currently, causative genes can be identified in ∼65% of PCD cases and we anticipate that this will improve as new genes are discovered . Although the poor sensitivity means that genotyping cannot be used in isolation, the Task Force agreed that it can be used to confirm a diagnosis in patients with other abnormal tests (e.g. HSVA) or where there is a high index of suspicion (e.g. a good clinical history but normal TEM, as can be the case for patients with DNAH11 or RSPH mutations) . Genetic testing and interpretation of results is not straightforward and needs experts who are aware of the complexities of PCD genotyping, and follow national and international best practice guidelines. Similarly, the Task Force found no studies on the use of IF as a diagnostic test for PCD. However, shortly after publication of the guidelines, a single-centre study reported on 368 patients referred for PCD diagnostic testing and a further 35 patients with an established diagnosis . Using six ciliary antibodies, they found IF to be highly specific for PCD and to be considerably quicker than TEM. However, they showed that, as for TEM and genetic testing, the sensitivity of IF is currently limited and concluded that IF is not suitable as a standalone test . What should happen after diagnostic tests? When a patient referred to a reference centre for possible PCD returns with the test results to the referring physician, several questions arise. Has the patient got PCD? With the currently available diagnostic tests, the decision of whether a patient has or has not got PCD is not always straightforward. There is no test or combination of tests that can exclude PCD with 100% certainty. The Task Force therefore recommends a standardised terminology to describe the results of the testing (figure 4). If the patient has a hallmark TEM defect or biallelic causative mutation in PCD genes, they are diagnosed as “PCD positive”. 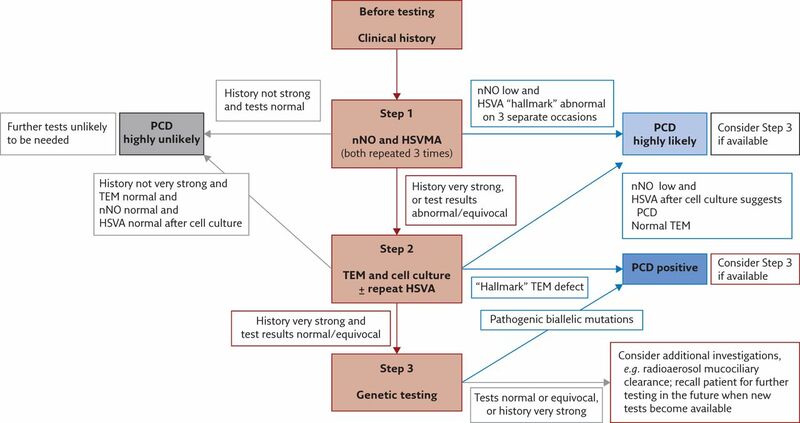 If all currently available tests have been completed but neither of the two criteria is fulfilled, the patient is labelled as “PCD highly likely” if nNO is repeatedly low and hallmark HSVM alterations are found on three separate occasions or after cell culture, or as “PCD highly unlikely” if all tests were normal. Even in experienced PCD diagnostic centres, a few patients will have inconclusive results because not all tests are available in the diagnostic centre or because they could not all be performed (for instance, in infants or when consent is refused). The following recommendations on continuing care (figure 5) are based on these diagnostic groups. How should the patient be managed following diagnostic testing? The PCD reference centre proposes a multidisciplinary management plan adapted to the patient and sees the patient at defined intervals (e.g. yearly) for a standardised assessment of the clinical course and for proposing additional tests or therapies based on upcoming evidence. The specialist (pulmonary or ENT physician) sees the patient in between these annual reviews (e.g. every 3 months), adapts therapies to the clinical course and treats exacerbations. The primary care physician performs all recommended immunisations, treats exacerbations and other (independent) diseases, and organises local therapeutic and psychosocial support if needed. Depending on the healthcare system in the country and region (rural or urban), tasks could be swapped from the specialist to the PCD centre, from the specialist to the GP or from the GP to the specialist. However, we feel strongly that the management plan should be set up and regularly monitored by a tertiary care reference centre that is specialised for PCD. For patients with a positive diagnosis of PCD, best practice includes counselling of the family regarding the outcome of the diagnostic tests, describing and starting the management of this lifelong condition, genetic counselling, and further assessments to investigate comorbidities and complications of PCD (figure 5). This includes investigations, in all patients, for clinically important defects associated with situs ambiguus (ECG and abdominal ultrasound), a thorough ENT investigation and fertility counselling for adults. Additional investigations (lung magnetic resonance imaging or computed tomography, ophthalmologic examination, etc.) are organised on a case-by-case basis. These investigations are best performed in the PCD centre or in close collaboration with it. Counselling of patients and their families by multidisciplinary professionals with expertise in PCD is important at this early stage, and additional information and support can be provided by patient organisations (e.g. http://pcdsupport.org.uk, www.kartagener-syndrom.org and www.pcdfoundation.org). Evidence for treatment is poor but the consensus of experts in the field suggests that multidisciplinary management should include regular airway clearance (physiotherapy) and exercise, a low threshold for antibiotic treatment of respiratory exacerbations, assessment and management of conductive hearing loss, and regular surveillance for airway infections . Additional management is decided on a case-by-case basis. For example, some patients require treatment for cardiac defects, hyposplenism or infertility. Where PCD is highly likely (figure 5), repeat testing or further investigations such as radioaerosol mucociliary clearance studies [29, 30] might be recommended by the PCD centre. However, a significant minority of patients will remain without a clear outcome. The Task Force recommends that if the diagnosis is highly likely, the patient should be told that they probably have PCD but given the limitations of current diagnostic tests, the diagnosis is not 100% certain . Patients should be treated in a specialist centre or in a shared care setting as if they have a positive diagnosis of PCD. Other diseases causing chronic upper and lower respiratory disease should be ruled out, if this has not been done before PCD testing. This includes, for instance, sweat tests for CF and investigations to rule out immunodeficiency. As new diagnostic tests become available, further investigations should be offered . Patients with an inconclusive diagnosis should have further management and investigations determined by a PCD reference centre or a specialist with expertise in PCD. The Task Force recommends reassessing the patient periodically, and considering alternative diagnoses associated with chronic wet cough and chronic ENT symptoms. Similarly, repeat PCD testing should be reconsidered at regular intervals, as the patients grow up, and new diagnostic tests become available . Where the diagnosis of PCD is highly unlikely, we recommend telling patients that further testing for PCD is not warranted . Their GP and pulmonary/ENT physicians will need to decide whether further investigations for other causes of their symptoms is needed. The ERS PCD Task Force has recently delivered the first evidence-based guidelines for the diagnosis of PCD. 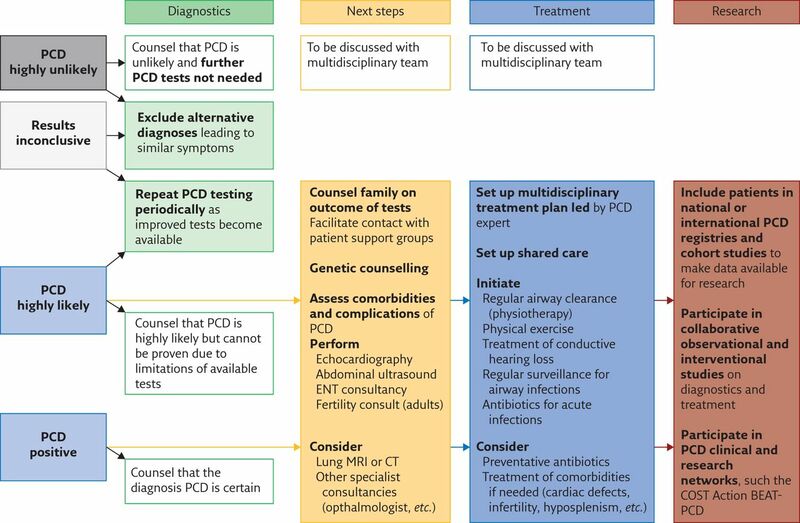 Whilst the guidelines primarily aimed to standardise approaches by PCD experts, it is vitally important that primary and secondary care professionals understand the context of the decisions surrounding key recommendations; it is these physicians who need to identify patients to refer for diagnostic testing and might share care with the specialist PCD service if the diagnosis is confirmed. The diagnosis of PCD is a rapidly evolving field and in the few months since the Task Force guidelines were published, a new PCD gene has been discovered [31, 32] and evidence for the role of IF in a diagnostic setting has been published . As new evidence arises, the guidelines will need revisiting and some patients should undergo repeat testing. More research is needed to clarify which patients should be tested. As we further our understanding of this heterogeneous condition, we are likely to find new phenotypes that challenge diagnostic decisions made in the current and past. There is no consensus on the approaches to most diagnostic tests, including HSVA and TEM; therefore, international standards are needed for the conduct and reporting of investigations. Future studies investigating clinical symptoms should have a longitudinal cohort design including consecutive referrals, instead of case–control designs; additionally, these studies should be conducted in the health setting for which we want information (primary, secondary or tertiary care). Although tools such as PICADAR are promising , their predictive abilities are still modest. It might be possible to improve the accuracy of such clinical prediction models by adding information on nNO and on a broader variety of or better specified symptoms, and by adapting the tools to specific age ranges (infant, pre-schoolers, school children and adults). This should help to define better which patients should be referred to a diagnostic centre for further testing. At present, with a large majority of PCD patients undiagnosed, our primary goal is to aim for a high sensitivity (i.e. miss few patients). However, as diagnostic testing for PCD is time consuming and costly, we must also aim for high PPVs. Patients must be diagnosed early and treatments installed as soon as possible, even for patients in whom the diagnosis is only highly likely rather than confirmed. Although published evidence is still scarce, it is likely that this will be beneficial for later lung function, long-term disease course and life expectancy. Since the evidence for the effect of different treatments on the course of PCD is very limited, it is important that we give each patient opportunities to participate in coordinated programmes of research. Over recent years, there has been a huge increase in the number of patients recruited to national and international registries , consortia research programmes and cohort studies , and results from these programmes are starting to provide the much needed evidence-base for managing this rare disease [18, 34, 35]. C.E. Kuehni and J.S. Lucas were leaders of the ERS PCD Task Force for PCD Diagnostics 2014–2016 (ERS TF-2014-04). They are chair and deputy chair of COST Action BEAT-PCD: Better Evidence to Advance Therapeutic options for PCD (BM 1407). Whilst the views expressed in this manuscript do not always reflect official views of these collaborations, we have attempted to clarify where the opinions are evidence-based recommendations from the Task Force. We would like to acknowledge the members of the ERS PCD Task Force who contributed to the work and images that are included in this manuscript: A. Barbato (Primary Ciliary Dyskinesia Centre, Dept of Woman and Child Health (SDB), University of Padua, Padua, Italy), A. Bush (Depts of Paediatrics and Paediatric Respiratory Medicine, Imperial College and Royal Brompton Hospital, London, UK), S.A. Collins (Primary Ciliary Dyskinesia Centre, University Hospital Southampton NHS Foundation Trust, and University of Southampton Faculty of Medicine, Academic Unit of Clinical and Experimental Medicine, Southampton, UK), M. Goutaki (Institute of Social and Preventive Medicine, University of Bern, and Dept of Paediatrics, Inselspital, University Hospital of Bern, University of Bern, Bern, Switzerland), L. Behan (Primary Ciliary Dyskinesia Centre, University Hospital Southampton NHS Foundation Trust, and University of Southampton Faculty of Medicine, Academic Unit of Clinical and Experimental Medicine, Southampton, UK), D. Caudri (Telethon Kids Institute, The University of Western Australia, Subiaco, Australia, and Dept of Pediatrics/Respiratory Medicine, Erasmus University, Rotterdam, The Netherlands), S. Dell (Division of Respiratory Medicine, The Hospital for Sick Children, and Dept of Pediatrics and Institute of Health Policy Management and Evaluation, University of Toronto, Toronto, ON, Canada), E. Eber (Division of Paediatric Pulmonology and Allergology, Dept of Paediatrics and Adolescent Medicine, Medical University of Graz, Graz, Austria), E. Escudier (Service de Génétique et Embryologie Médicales, Centre de Référence des Maladies Respiratoires Rares, Hôpital Armand Trousseau, Assistance Publique – Hôpitaux de Paris (AP-HP), and Inserm UMR_S933, Sorbonne Universités (UPMC Univ Paris 06), Paris, France), R.A. Hirst (Centre for PCD Diagnosis and Research, Dept of Infection, Immunity and Inflammation, University of Leicester, Leicester Royal Infirmary, Leicester, UK), C. Hogg (Depts of Paediatrics and Paediatric Respiratory Medicine, Imperial College and Royal Brompton Hospital, London, UK), M. Jorissen (ENT Dept, University Hospitals Leuven, Leuven, Belgium, and University of North Carolina at Chapel Hill, Chapel Hill, NC, USA), P. Latzin (Dept of Paediatrics, Inselspital, University Hospital of Bern, University of Bern, Bern, Switzerland), M. Legendre (Service de Génétique et Embryologie Médicales, Centre de Référence des Maladies Respiratoires Rares, Hôpital Armand Trousseau, AP-HP, and Inserm UMR_S933, Sorbonne Universités (UPMC Univ Paris 06), Paris, France), M.W. Leigh (University of North Carolina at Chapel Hill, Chapel Hill, NC, USA), F. Midulla (Paediatric Dept, Sapienza University of Rome, Rome, Italy), K.G. Nielsen (Danish PCD and chILD Centre, CF Centre Copenhagen, Paediatric Pulmonary Service, Dept of Paediatrics and Adolescent Medicine, Copenhagen University Hospital, Rigshospitalet, Copenhagen, Denmark), H. Omran (Dept of Pediatrics, University Hospital Münster, Münster, Germany), J.F. Papon (AP-HP, Hôpital Kremlin-Bicetre, service d’ORL et de chirurgie cervico-faciale, and Faculté de Médecine, Université Paris-Sud, Le Kremlin-Bicêtre, France), P. Pohunek (Paediatric Dept, Second Faculty of Medicine, Charles University and Motol University Hospital, Prague, Czech Republic), B. Redfern (PCD Family Support Group, Milton Keynes, UK), D. Rigau (ERS methodologist), B. Rindlisbacher (Kartagener Syndrom und Primäre Ciliäre Dyskinesie e. V., Steffisburg, Switzerland), F. Santamaria (Pediatric Pulmonology, Dept of Translational Medical Sciences, Federico II University, Azienda Ospedaliera Universitaria Federico II, Naples, Italy), A. Shoemark (Depts of Paediatrics and Paediatric Respiratory Medicine, Imperial College and Royal Brompton Hospital, London, UK), D. Snijders (Primary Ciliary Dyskinesia Centre, SDB, University of Padua, Padua, Italy), T. Tonia (ERS methodologist), A. Titieni (Dept of Pediatrics, University Hospital Münster, Münster, Germany), W.T. Walker (Primary Ciliary Dyskinesia Centre, University Hospital Southampton NHS Foundation Trust, and University of Southampton Faculty of Medicine, Academic Unit of Clinical and Experimental Medicine, Southampton, UK) and C. Werner (Dept of Pediatrics, University Hospital Münster, Münster, Germany). We would also like to acknowledge C. Casaulta (Paediatric Respiratory Medicine, Dept of Paediatrics, Inselspital, Bern University Hospital, University of Bern, Bern, Switzerland), B. Rubbo (NIHR Southampton Respiratory Biomedical Research Unit, University of Southampton Faculty of Medicine and University Hospital Southampton NHS Foundation Trust, and Primary Ciliary Dyskinesia Centre, University Hospital Southampton NHS Foundation Trust, Southampton, UK), M. Goutaki, Florian Halbeisen (Institute of Social and Preventive Medicine, University of Bern, Bern, Switzerland), Romain Lazor (Interstitial and Rare Lung Disease Unit, Respiratory Medicine Dept, University Hospital, Lausanne, Switzerland), Claire Jackson (Primary Ciliary Dyskinesia Centre, University Hospital Southampton NHS Foundation Trust, and Clinical and Experimental Sciences Academic Unit, University of Southampton Faculty of Medicine, Southampton, UK) and W.T. Walker for comments on previous versions of this manuscript. Both authors conceived and wrote the paper together. Support statement Research on primary ciliary dyskinesia (PCD) at the Institute of Social and Preventive Medicine, Bern, Switzerland, is supported by a grant from the Swiss National Foundation to C. Kuehni (SNF320030_173044), and grants from the Milena-Carvajal Pro Kartagener Foundation, and the Lung Leagues of Bern, St Gallen, Vaud, Ticino and Valais. The National PCD Centre in Southampton, UK, is commissioned and funded by NHS England. Research in Southampton is supported by the National Institute for Health Research (NIHR) Southampton Biomedical Research Centre, NIHR Wellcome Trust Clinical Research Facility, NIHR (RfPB PB-PG-1215-20014) and The AAIR Charity (registered number 1129698). Both authors participate in the network of COST Action BEAT-PCD: Better Evidence to Advance Therapeutic options for PCD (BM 1407). , et al. Clinical manifestations in primary ciliary dyskinesia: systematic review and meta-analysis. Eur Respir J 2016; 48: 1081–1095. , et al. Primary ciliary dyskinesia and neonatal respiratory distress. Pediatrics 2014; 134: 1160–1166. , et al. Laterality defects other than situs inversus totalis in primary ciliary dyskinesia: insights into situs ambiguus and heterotaxy. Chest 2014; 146: 1176–1186.
. Primary ciliary dyskinesia and associated sensory ciliopathies. Expert Rev Respir Med 2016; 10: 569–576. , et al. European Respiratory Society guidelines for the diagnosis of primary ciliary dyskinesia. Eur Respir J 2017; 49: 1601090.
, et al. Mutations in DNAH5 cause primary ciliary dyskinesia and randomization of left-right asymmetry. Nat Genet 2002; 30: 143–144. , et al. Mutations in CCDC39 and CCDC40 are the major cause of primary ciliary dyskinesia with axonemal disorganization and absent inner dynein arms. Hum Mutat 2013; 34: 462–472. , et al. Factors influencing age at diagnosis of primary ciliary dyskinesia in European children. Eur Respir J 2010; 36: 1248–1258. , et al. Diagnosing primary ciliary dyskinesia: an international patient perspective. Eur Respir J 2016; 48: 1096–1107. , et al. Management of primary ciliary dyskinesia in European children: recommendations and clinical practice. Eur Respir J 2012; 39: 1482–1491. , et al. The international primary ciliary dyskinesia cohort (iPCD Cohort): methods and first results. Eur Respir J 2017; 49: 1601181.
, et al. GRADE guidelines: 2. Framing the question and deciding on important outcomes. J Clin Epidemiol 2011; 64: 395–400. , et al. GRADE: assessing the quality of evidence for diagnostic recommendations. Evid Based Med 2008; 13: 162–163. , et al. The dangers of widespread nitric oxide screening for primary ciliary dyskinesia. Thorax 2016; 71: 560–561.
. Towards an earlier diagnosis of primary ciliary dyskinesia: which patients should undergo detailed diagnostic testing? Ann Am Thorac Soc 2016; 13: 1239–1243. , et al. PICADAR: a diagnostic predictive tool for primary ciliary dyskinesia. Eur Respir J 2016; 47: 1103–1112. , et al. Clinical features and associated likelihood of primary ciliary dyskinesia in children and adolescents. Ann Am Thorac Soc 2016; 13: 1305–1313. , et al. Diagnostic testing in primary ciliary dyskinesia. Eur Respir J 2016; 48: 960–961. , et al. Nasal nitric oxide screening for primary ciliary dyskinesia: systematic review and meta-analysis. Eur Respir J 2014; 44: 1589–1599. , et al. Establishing normative nasal nitric oxide values in infants. Respir Med 2015; 109: 1126–1130.
. Hand-held tidal breathing nasal nitric oxide measurement–a promising targeted case-finding tool for the diagnosis of primary ciliary dyskinesia. PLoS One 2013; 8: e57262. , et al. Ciliated air-liquid cultures as an aid to diagnostic testing of primary ciliary dyskinesia. Chest 2010; 138: 1441–1447. , et al. Culture of primary ciliary dyskinesia epithelial cells at air–liquid interface can alter ciliary phenotype but remains a robust and informative diagnostic aid. PloS One 2014; 9: e89675. , et al. Accuracy of immunofluorescence in the diagnosis of primary ciliary dyskinesia. Am J Respir Crit Care Med 2017; 196: 94–101. , et al. Primary ciliary dyskinesia: a consensus statement on diagnostic and treatment approaches in children. Eur Respir J 2009; 34: 1264–1276. , et al. Pulmonary radioaerosol mucociliary clearance in diagnosis of primary ciliary dyskinesia. Chest 2007; 132: 966–976. , et al. Pulmonary radioaerosol mucociliary clearance in primary ciliary dyskinesia. Eur Respir J 2014; 44: 533–535. , et al. X-linked primary ciliary dyskinesia due to mutations in the cytoplasmic axonemal dynein assembly factor PIH1D3. Nat Commun 2017; 8: 14279.
, et al. Mutations in PIH1D3 cause X-linked primary ciliary dyskinesia with outer and inner dynein arm defects. Am J Hum Genet 2017; 100: 160–168. , et al. An international registry for primary ciliary dyskinesia. Eur Respir J 2016; 47: 849–859. , et al. Clinical features of childhood primary ciliary dyskinesia by genotype and ultrastructural phenotype. Am J Respir Crit Care Med 2015; 191: 316–324. , et al. Standardizing nasal nitric oxide measurement as a test for primary ciliary dyskinesia. Ann Am Thorac Soc 2013; 10: 574–581.